New Zealand - a great place to invest in real estate. The country has a very high standard of living, beautiful nature, magnificent sandy beaches and ski resorts - all this splendor is complemented by the wonderful lakes and islands. For business people will approach such large cities like Oakland and, of course, the capital - Wellington - a cultural and economic centers of the country. Queenstown City - a great ski center, Dunedin - full of attractions, and Christchurch is located on the ocean front and offers all kinds of water sports and recreation. These cities are good for permanent residence and income in rentals due to the large number of tourists. 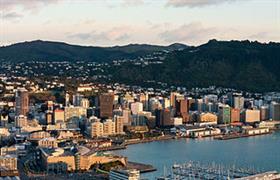 Properties in New Zealand in any of these cities will be an excellent choice. The cost of housing in the country is quite high and is comparable with prices of European counterparts, but the price formation depends on the location of the object. The most expensive housing - prestigious new villas on the ocean, but land in remote areas is quite inexpensive. The most cost-effective real estate purchase in New Zealand - apartments, although there is a shortage of them in the country. The last economic crisis, of course, reflected on the housing market, but this resulted in only a small change in prices. Special problems were not observed, especially because the lack of proposals will only further increase the cost of housing. New developments in the country are represented by cheap flats from the builder in apartment complexes in the outskirts of towns, luxury apartments in the center, or villas of various sizes and price ranges. Flats, of course, are considerably less, as in New Zealand is more widespread to live in a house. Houses can be duplex with separate entrances and small plots of land, or prestigious detached villas with a garden. The quality of construction in the country is at a high level. It is also popular to buy land for development. Acquisition of real estate by foreigners in the country has a small limitation: there is a maximum cost, which can be spent for a property and its excess should be done with special permission from the authorities. There is a limit value of the size of the area in the purchase of land too. Sale of land on the islands and around the lakes is also under a special control.